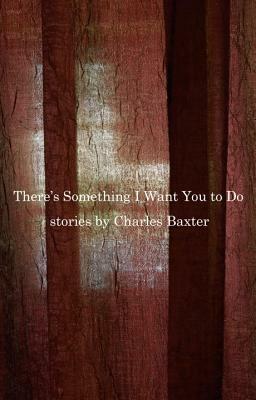 From one of the great masters of the contemporary short story, here is an astonishing collection that showcases Charles Baxter's unique ability to unveil the remarkable in the seemingly inconsequential moments of an eerie yet familiar life. Penetrating and prophetic, the ten inter-related stories in There's Something I Want You to Do are held together by a surreally intricate web of cause and effect--one that slowly ensnares both fictional bystanders and enraptured readers. Benny, an architect and hopeless romantic, is robbed on his daily walk along the Mississippi River, and the blow of a baseball bat to the back of his knee feels like a strike from God. A drug dealer named Black Bird reads Othello while waiting for customers in a bar. Elijah, a pediatrician and the father of two, is visited nightly by visions of Alfred Hitchcock. Meanwhile, a dog won't stop barking, a passenger on a transatlantic flight reads aloud from the book of Psalms during turbulence, and a scream carries itself through the early-morning Minneapolis air. As the collection progresses, we delve more deeply into the private lives of these characters, exploring their fears, fantasies, and obsessions. They appear and reappear, performing praiseworthy and loathsome acts in equal measure in response to the request--or demand--lodged in each story's center. The result is a portrait of human nature as seen from the tightrope that spans the distance between dreams and waking life--a portrait that could have arisen only from Baxter's singular vision. Readers will be stunned by his uncanny understanding of human attraction and left to puzzle over the meaning of virtue and the unpredictable and mysterious ways in which we behave. Charles Baxter is the author of the novels The Feast of Love (nominated for the National Book Award), The Soul Thief, Saul and Patsy, Shadow Play, and First Light, and the story collections Gryphon, Believers, A Relative Stranger, Through the Safety Net, and Harmony of the World. The stories -Bravery- and -Charity, - which appear in There's Something I Want You to Do, were included in Best American Short Stories. Baxter lives in Minneapolis and teaches at the University of Minnesota and in the MFA Program for Writers at Warren Wilson College.